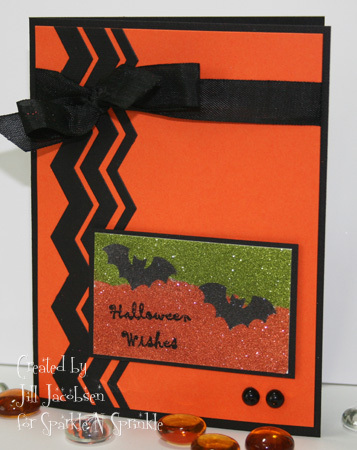 Shared Inspiration by Jill Jacobsen: Soft Micro Glitters! It's been a while:) We just moved the Sparkle N sprinkle store and that took me away from stamping. Then I went away to a scrap retreat last weekend...I will share some of my layouts with you this week....I was thrilled that I finished 13 pages!! So the big news at Sparkle N Sprinkle this week (besides the new store) is we are now carrying Micro Fine Glitters! They are unbelievably soft!! They feel like velvet!! I had to make some quick cards using the glitter, so I used the Super Adhesive Sheets (they hold lots of glitter for a really soft feel!). On the dragonfly I used Black Suede and embossed on top of the glitter (which is real easy by the way) with Pear EP. 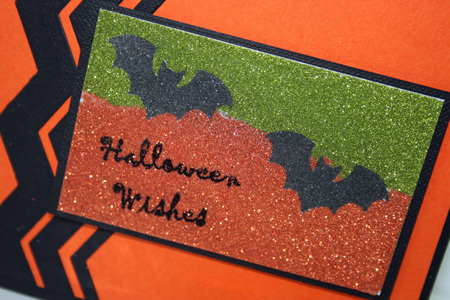 On the Halloween card I did some layering with the glitter. First you punch out the bats with the release paper you take off the Adhesive Sheet and put them down on the tape, then tear the remainder in half and lay it on the bottom portion of the tape. Then you put the Luau Green Glitter down, peel up the bottom half and lay down the Tiger Orange Glitter, and lastly, peel up the bats and apply the Black Suede. 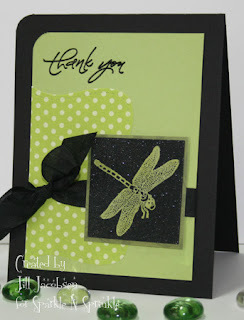 I also embossed the sentiment from the new stampette set The Good Witch. If you have never tried Micro Fine Glitters, they can be used the same way as the Ultra Fine. They even look nice using the Quickie Glue Pen and highlighting areas. Thanks for stopping by...and have a blessed Labor Day!! Wow, I can't wait to try out these new glitters, Jill. Love what you've done with them on your cards. Can't wait to get those glitters... I have one and love it! You have been very busy!! Love the cards you made with this new glitter. I have played with it some and it is awesome!! Such pretty cards and I love the glitter! Aren't the glitters fun to use? Wow! Love what you have done with the new glitters, Jill. The cards look super! I love what you did with both of these Jill. But I particularly LOVE the dragonfly card! 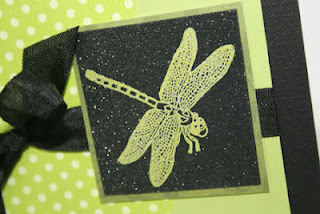 I love dragonflies to begin with, but I just love how you did the embossing on top of the glitter - it looks amazing! Two great cards Jill! !